Seller hereby represents and warrants to that it is the absolute owner of the above Articles, that said Articles are free and clear of all liens, charges, security interests, and encumbrances, and that Seller has full right, power and authority to sell said Articles and to make this Bill of Sale. The employees or representatives of the SELLER are not authorized to make any statements as to the quality and condition of the ARTICLES being offered for sale, other than the written statements made herein. Buyer acknowledges that any such statement made will not be binding on the SELLER. Except for warranty of title, the above personal property is sold AS IS, WHERE IS and WITH ALL FAULTS. Seller makes no other express or implied representations of any kind with regard to the Articles. THE PARTIES AGREE THAT THE IMPLIED WARRANTIES OF MERCHANTABILITY AND FITNESS FOR A PARTICULAR PURPOSE ARE EXCLUDED FROM THIS TRANSACTION AND SHALL NOT APPLY TO THE ARTICLES SOLD. Seller shall not be responsible for damages of any kind (including, but not limited to, direct, incidental or consequential damages) to anyone for any deficiencies or failure of any Articles for any reason. BUYER assumes all risk of loss after title has passed. Title to ARTICLES shall transfer from the SELLER FOB shipping point or at the time the BUYER commences removal activities from SELLERS premises In both cases, BUYER shall be responsible for the maintenance, operation and disposal of the ARTICLES in accordance with applicable law thereafter. BUYER indemnifies, defends and holds Seller harmless against any and all liability and damage, including, but not limited to, reasonable attorneys fees arising out of any claim for personal injury, sickness, and death to any person and for any property damage caused by the Articles or by hazardous chemicals or other hazardous materials on or in the Articles, whether or not due to the negligence of Seller, during the commencement of the dismantling or other work by BUYER and thereafter following delivery by Seller. BUYERs removal aforesaid will be coordinated by the BUYER with Seller, and this coordination shall include, without limitation, directing and monitoring progress all of all aspects of the REMOVAL, sequencing of the REMOVAL, and the review and approval of any changes to the REMOVAL or to the schedules if so required The BUYER shall provide, without limitation, all trucks, fork trucks, pallet jacks, slings, shackles, dollys, beam clamps, chains, packing, cradles, rigging, cranes, lulls, flagman, personnel, operating engineers, and other similar equipment and personnel as may be required to remove the EQUIPMENT from the REMOVAL AREA and onto trucks for shipment offsite (the REMOVAL). BUYER shall take any and all precautions necessary to protect Sellers facility, including, without limitation, areas surrounding the REMOVAL AREA, roadways and sidewalks. The BUYER shall be responsible for the repair of any and all damage to property resulting from the REMOVAL. Any and all debris created by the BUYER in performance of the REMOVAL, shall be removed daily, leaving the area in good housekeeping condition. In the event any Seller permits are required in the course of the REMOVAL, BUYER shall initiate and coordinate with EQUIPNET, and Buyer will execute, subject to Seller approval thereof, any permits required to safety perform the work. 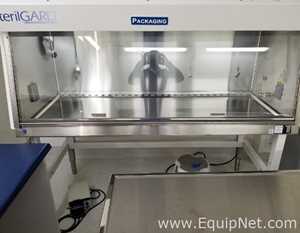 BUYER acknowledges that all descriptions of the EQUIPMENT are a good faith attempt to accurately reflect the specifications of the EQUIPMENT being offered for sale. The BUYER is responsible for verifying the truth and accuracy of all EQUIPMENT listing information. All items are sold as is, where is, and with all faults. Seller makes no warranty, expressed or implied as to the nature, quality, value or condition of any piece of EQUIPMENT. Seller expressly disclaims any warranty of merchantability, fitness for a particular purpose or non-infringement. EQUIPMENT is being sold without software, if any is applicable. In the event that software is included in the EQUIPMENT sale, notwithstanding the disclaimer set forth above, Seller makes no representation or warranties regarding the BUYERS right to use such software, as to the performance of the software, its non-infringement or otherwise. BUYER is to assume no piece of EQUIPMENT carries a manufacturers warranty at the time this item is offered for sale. Collection of all applicable taxes shall be in accordance with federal, state and local tax laws. If the BUYER does not remove the purchased piece of EQUIPMENT during the stated removal period, Seller, in conjunction with EQUIPNETs Buyer Terms, may deem the item to have been abandoned by the BUYER and thereupon the BUYER shall have no further rights with respect to the piece of EQUIPMENT. BUYER agrees to comply with all US export control and related laws, and acknowledges that Seller is not the exporter of any purchased piece of EQUIPMENT. Certain pieces of EQUIPMENT may constitute Restricted Technology. Under federal law, such items may not be shipped outside of the United States. Seller makes no representation or warranty concerning, and has conducted no investigation to ascertain which items, if any, constitute Restricted Technology. Seller reserves the right to cancel any sale at any time in the event it determined, in its sole discretion, hat the sale does or may violate applicable U.S. export control or similar laws. It is the BUYERS sole responsibility to meet all government safety and environmental standards in removing, shipping and using any purchased EQUIPMENT. Certain items of EQUIPMENT may contain hazardous substances as that term is defined under federal, state or local environmental laws and regulations. EQUIPMENT may also include "asbestos containing materials" as defined by USEPA, OSHA or other federal, state or location laws or regulations. While the Seller may have cleaned the equipment prior to sale it is the Buyers responsibility to ensure it contains to materials that would affect it intended use and Seller makes no warranties or representations to that effect. Seller shall be liable for its failure to perform hereunder if said performance is made impracticable due to any occurrence beyond its reasonable control, including act of God, fires, floods, wars, sabotage, accidents, labor disputes or shortages, governmental laws, ordinances, rules and regulations, whether valid or invalid, and any other similar or different occurrence. If, due to any occurrence, Seller is unable to supply SURPLUS ITEMS specified in this Agreement or any portion thereof and appropriate adjustment to the Sales Price paid by Buyer will be made. In no event shall Seller be obligated to purchase or manufacture/generate SURPLUS ITEMS or other ITEMS in order to enable it to deliver SURPLUS ITEMS to Buyer. The Buyers only and total recourse would be for a refund of paid money. This Agreement shall be governed by and shall be construed according to the laws of the State of Massachusetts as if executed and to be performed wholly within the State of Massachusetts. All actions, legal or other, instituted by BUYER under this Agreement must be filed in a federal or state court located in Boston, Massachusetts. In the event that any provision of this Agreement shall be found by a court of competent jurisdiction to be invalid or unenforceable as written as a matter of law, then only those provisions will be deemed invalid and the remaining part of this Agreement will remain valid and enforceable. The validity, interpretation and performance of this Agreement with respect to SURPLUS ITEMS delivered or to be delivered hereunder shall be governed by the laws of the Commonwealth of Massachusetts. This Agreement contains all of the representations and agreements of the parties hereto pertaining to the subject matter hereof, and there are no oral understandings, representations or warranties affecting it. This Agreement shall be binding upon and endure to the benefit of the respective successors and assigns of each of the parties hereto, but any assignment hereof by Buyer without the prior written consent of Seller shall be void. No modifications of this Agreement or waiver of the terms or conditions hereof shall be binding upon Buyer or Seller unless approved in writing by an authorized representative, or shall be effected by the acknowledgment or acceptance of purchase order forms containing other or different terms or conditions whether or not signed by an authorized representative of Buyer or Seller. Neither course of performance nor course of dealing nor usage of trade shall be used to interpret, construe, qualify, explain or supplement any of the terms of this Agreement.